My Online Role Playing game of choice. The game is quite a lot easier than it was in the early 2000s mind you. You can find sometimes still on Cerberus as Waves. If You are 10.7 or 10.8 - use Wineskin - Snow Leo people can use Wineskin as well. 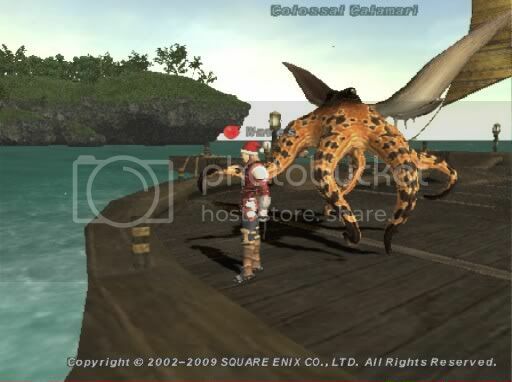 The story is set in the fantasy world of Vana'diel, where player-created avatars can both compete and cooperate in a variety of objectives to develop an assortment of jobs, skills, and in-game item rewards. Players can also undertake an array of quests and progress through the in-game hierarchy and thus though the major plot of the game. 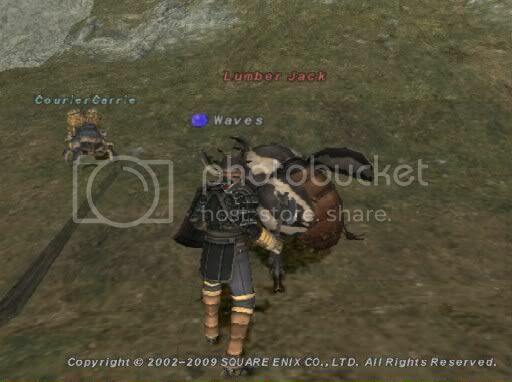 Since its debut in 2002, four expansion packs have also been released, adding numerous areas, quests, and item rewards to the Final Fantasy XI world. - about 13 gigs of Hard Drive Space required. - For CXE - Combine all 3 parts with 7.zip - mount the .dmg and drag the final fantasy xi folder to your application eject the disc image. - For Wineskin Combine all 3 parts with 7.zip - mount the .dmg and drag the final fantasy xi folder to your application eject the disc image. - Install the game to the default folder. Click and play. 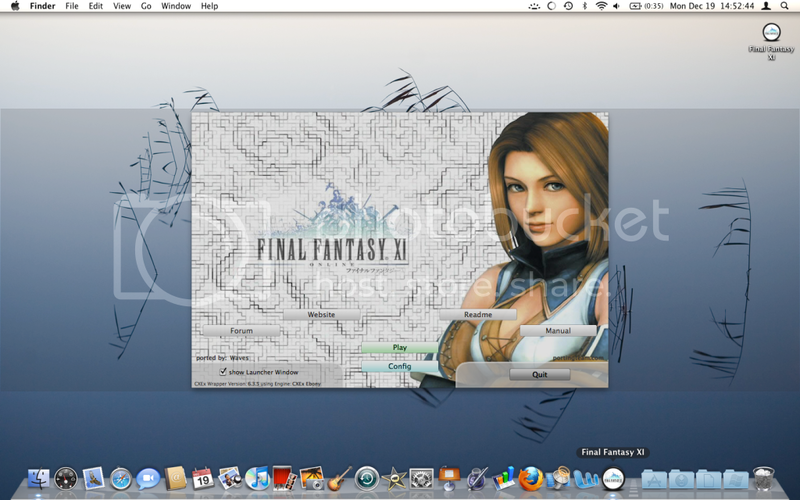 Or Copy your Final Fantasy XI folder over through bootcamp or parallels, etc. Playonline already installed. 1.1 - Minor tweaks and reupload. This works as of the February 2012 update. Quick update - this Port broke with the March 26th update - but is now fixed as of the April 3rd update - - thanks to jeffreychoo for the updates. If I download this, am I required to pay a subscription fee? The game has a monthly subscription yes. You can play on private servers. You can also get a free 30 day trial. Re-uploaded today - the game is working as of August 5th 2012 - Compatible with the July 23rd update. Likely not working (though untested) with Mountain Lion - Mountain Lion upload on request only via Private Message. Tested today and the Game is working on 10.6 Snow Leo with both the CXE / Wineskin ports. 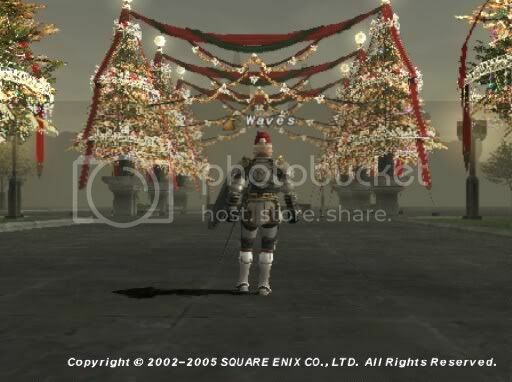 Hey waves, I downloaded and completed the installation of FFXI using Wineskin and 7zip. I even updated the game (waited a whole bloomin' day for it to update lol) and everything was fine and dandy, until wanting to START the game. I get an error straight away that says "the program has encountered a serious error and needs to close"
This was the error I got below. Im running Mountain Lion, and followed every step to the dot. Unhandled exception: page fault on read access to 0x00000000 in 32-bit code (0x011d8dc2). My Macintosh is currently a paper weight so I can really trouble shoot except off the top of my head right now. So right click the app - what size is it - ie how many gigs? What version of Wineskin is it? - I see the engine is 1.4.1. Are you on 10.8.2? - or something else? All right so it is the first issue. The game should be about 13 gigs. I am not sure what you did not install. Ok, so basically Ive followed the steps as above, but when trying to get a Playonline ID, I had to register a trial version which Ive upgraded to a full payable service. What Im attempting right now is uninstalling the whole thing, and starting again from the disc image. Its currently telling me that it has 31146 files to download, which looks like its gonna take all night. Will update you on what happens after this. Not too optimistic as this is the same amount of files I had to download last time. Thanks for this. Got super excited when I got to the "Play Now" screen in POL, but like the previous poster, FFXI crashes when it goes to launch the game. Running on Mac OS X 10.8.2 (Mountain Lion), Wineskin 2.5.9 with engine WS9Wine 1.5.25. Downloaded the port in 3 parts, unzipped into wavesffxiw.dmg, double-clicked the dmg to mount, dragged FFXI to the applications folder. Unhandled exception: page fault on read access to 0x00000000 in 32-bit code (0x012d8dc2). Please let me know if I'm doing something wrong. Thanks man. How do you use a gamepad?